It’s easy as worship leaders to clock-in on Sunday mornings, and pour all of our effort into the “performance”; pulling for an impassioned & expertly played set of epic corporate anthems & ballads, familiar to all in attendance, & sung at the top of our lungs. And there’s nothing – in & of itself – wrong with that: God deserves our best. However, do we oft-times miss another opportunity that is before us? If the role of a “Worship Pastor” is first & foremost that of a song leader, we have no Biblical, New Testament office to fill, however I believe that understanding of our role misses the mark entirely. Worship Pastors are to be PASTORS FIRST, called to shepherd/disciple those under our care – calling out the gold in the fellow musicians & creatives in their faith community – raising up the next generation to take our place. 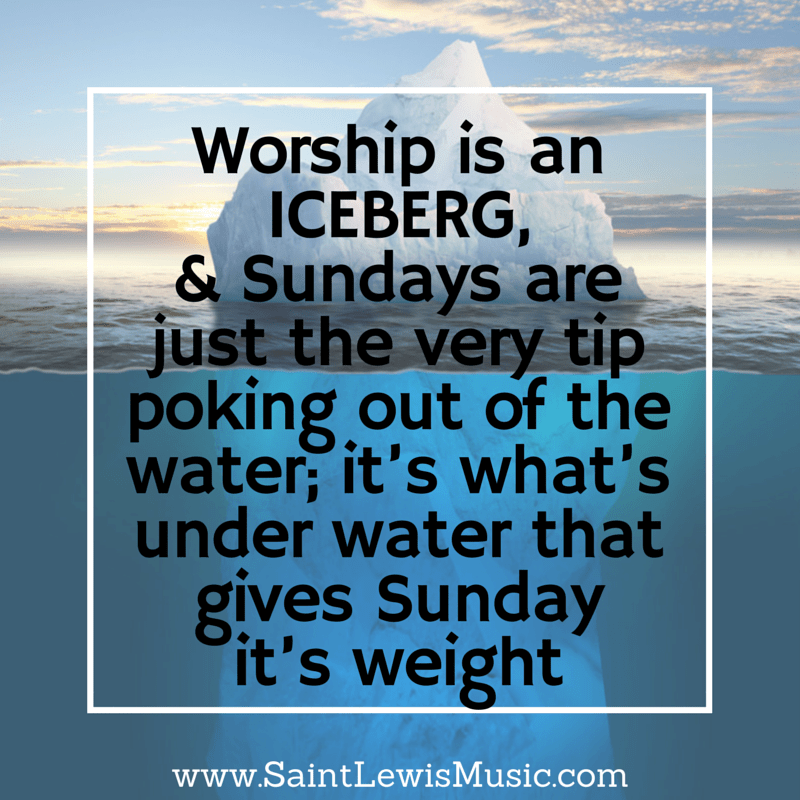 Though it’s true for all believers, it’s even more applicable to the Worship Pastor: worship is an Iceberg, & Sundays are just the very tip poking out of the water; it’s what’s under water that gives Sunday it’s weight. “Proskuneo” is something that OVERFLOWS out of people when face-to-face with GREATNESS. There are several words in the Bible we translate as “worship”, but my personal favorite is “proskuneo” which literally means “to kiss the feet”, because someone doesn’t just nonchalantly think, “Oh, that person is of some importance – I should probably kiss their feet” – NO, because it’s gross – “proskuneo” is something that OVERFLOWS out of people when face-to-face with GREATNESS. It’s a response to pure AWE! Those times in worship are my favorites. The problem is, we are broken people – leaky vessels: like Moses, we come down off the mountain & the glory fades – we’re like the people of Israel who experienced miracle after miracle, and get delivered from slavery to moments later begin complaining about the food. That’s why – as worship pastors – DISCIPLESHIP & TRAINING are the key elements to raising up a worshiping church, both from the platform, & behind the scenes. Honestly, I am honored every time that I am entrusted to lead God’s people to respond to who God is and what He has done, because God is AWESOME, but we’re called to more than that. God has called us to authentically lead – yes – but as part of that leading, to also raise and equip the next generation of leaders. That’s the Biblical call of the Worship pastor, & that is what we are to aspire to. What chapters & verses inform your understanding of what it means to be a “Worship Pastor”?